Exploring any national park in less than a day is incredibly challenging but when you are planning a visit to the largest national park outside of Alaska, it adds another layer of complexity to the challenge. That’s exactly what I did during my adventure out west when I decided to take a day trip from Las Vegas to Death Valley National Park, en route to driving through California to meet Heather in San Jose. Having heard many rumors of the searing hot temperatures and lack of cell phone service throughout Death Valley, I admittedly started this solo adventure with a little trepidation but of course, plenty of excitement! For those of you that don’t the stereotype associated with Death Valley, well it’s pretty much the hottest spot in North America. 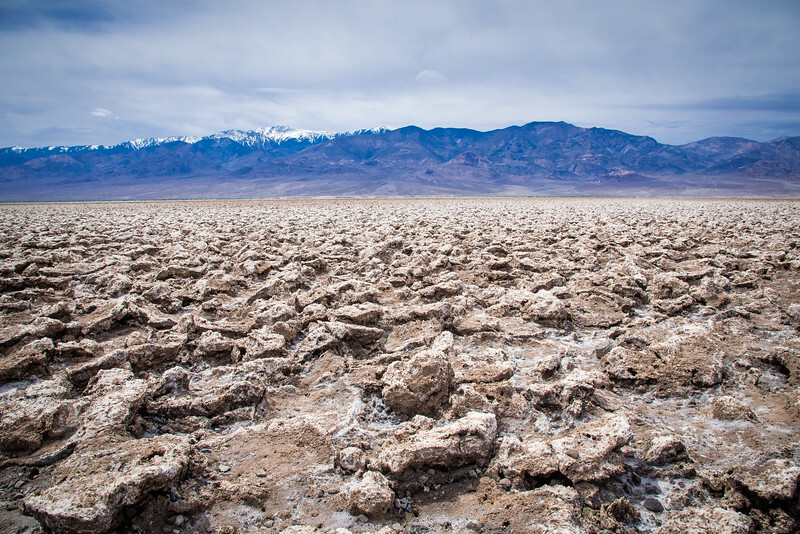 That’s right, in 1913, a weather observation station in Death Valley measured 134 degrees Fahrenheit. Fortunately, my trip to this national park was at the beginning of April and with a chilly high of only 85 degrees, temperature wasn’t going to be a problem for this trip. 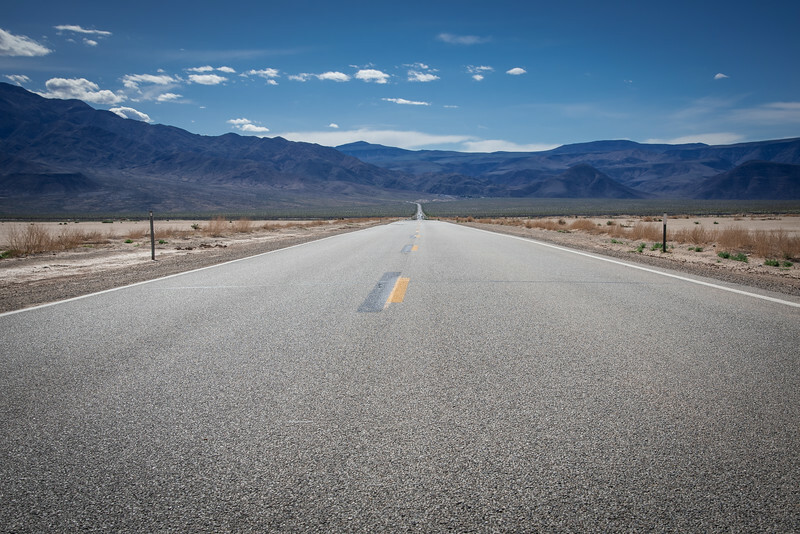 Whether you are intrigued by the thought of visiting the lowest point in North America (Death Valley NP is not only the hottest point but also the lowest) or you simply want to head out on to the open roads and drive in the middle of nowhere, Death Valley is certainly the place for you. 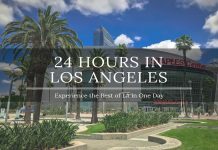 I was particularly intrigued by some of the highlight attractions and admittedly, I was curious at just how much I could experience in only one day. I have been fortunate to experience a variety of awesome road trips, none more so than Salt Lake City to Yellowstone but there was something about this trip from Vegas to Death Valley that I was really excited about. Let’s take a look at how you can maximize your time and make the most of a day trip to Death Valley! 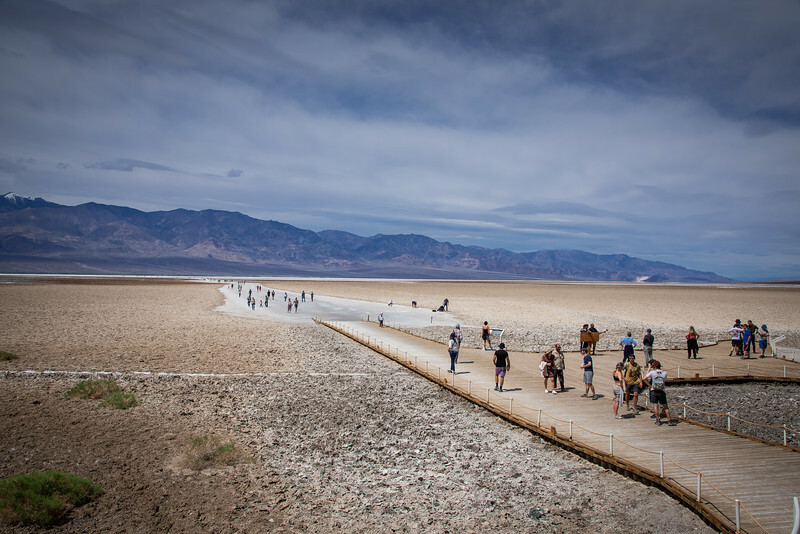 It’s fair to say that unless you are an effective planner, you could quite easily be overwhelmed pretty quickly at the thought of trying to experience Death Valley in only one day. But that’s why you are reading this post right? Don’t worry, if you follow the recommended itinerary, I am confident that you will have an amazing visit to Death Valley just as I did. 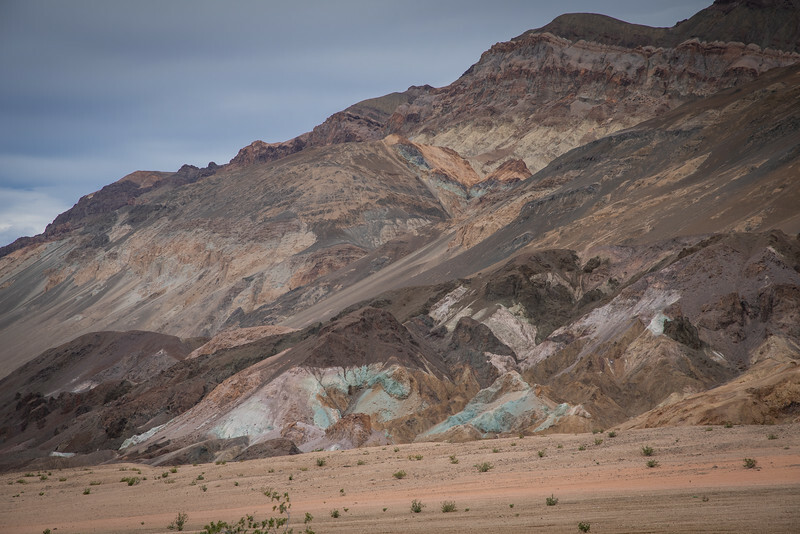 The beauty of Death Valley is not only in the gorgeous panoramic landscapes reflecting the breathtaking geology of the area but also because the size of this national park allows visitors to follow a number of different alternative routes. 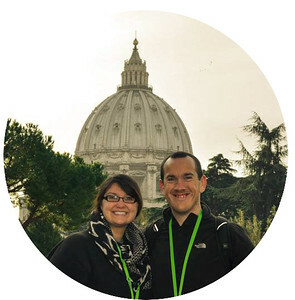 Here are a couple of “alternatives” that you could follow and still enjoy an amazing day trip but it’s the third option that I took and I would argue it’s the best out of the three. 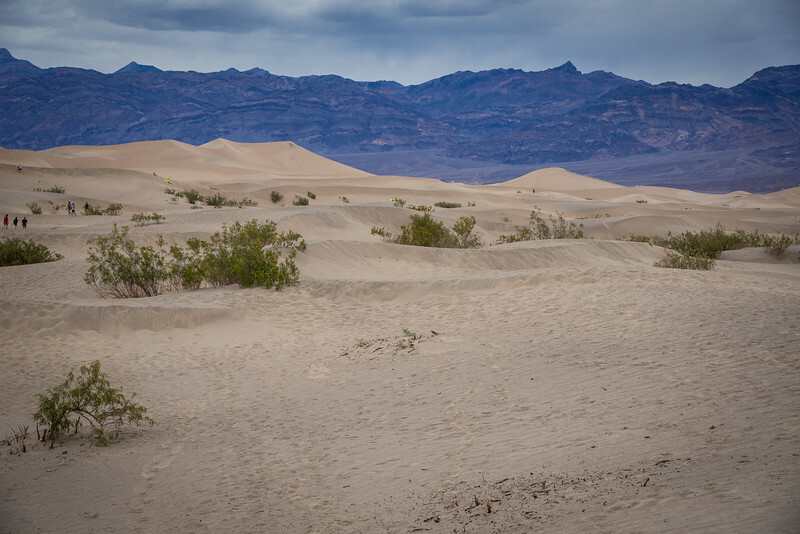 How much time will you have to experience Death Valley? What type of landmarks/attractions/landscapes are you most interested in visiting? Are you planning a “round-trip” and returning to Las Vegas (or heading out west to California)? How much driving are you willing to do? Do you want to experience sunrise/sunset in Death Valley? Ok, so you have all the above questions answered…it’s time to pick which route to take. The only difference between these is the time it’s going to take to reach the entrance to Death Valley and exactly which side of the park you want to start on. 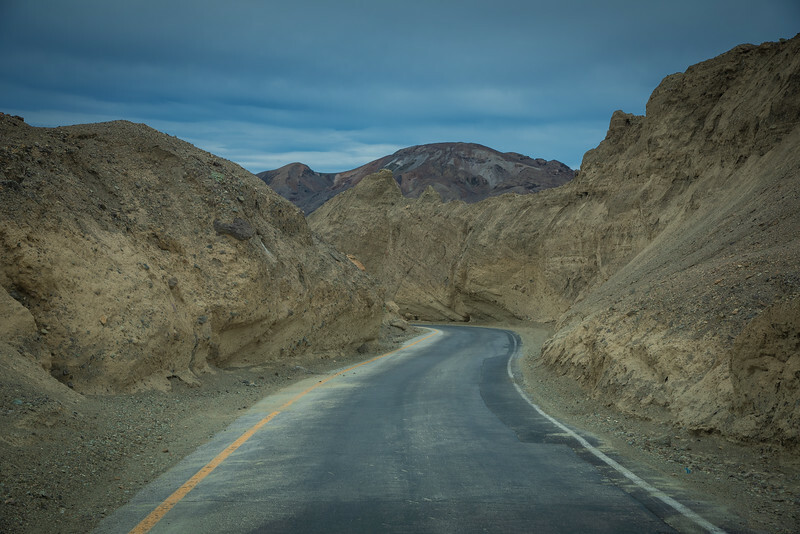 It goes without saying that regardless of which route you opt for, in order to maximize your visit to Death Valley, you need to be prepared for an early start. 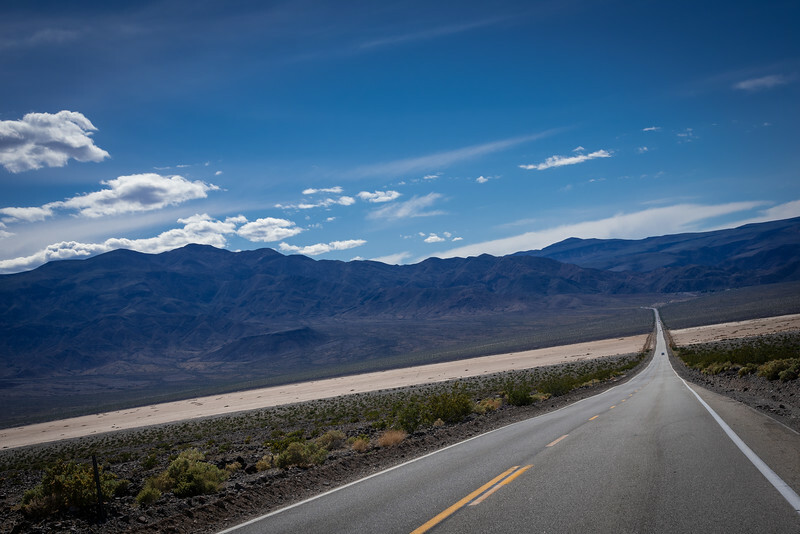 If you follow this route heading into the park from the Shoshone entrance, you will quickly arrive at one of the highlight attractions throughout the park – Badwater Basin! 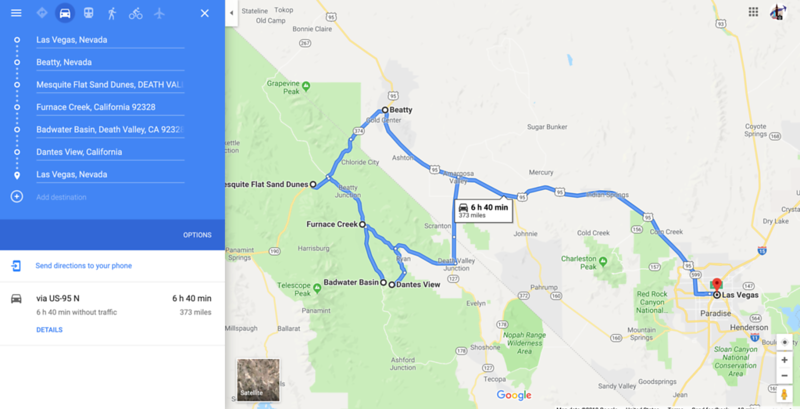 This route is definitely one that is recommended if you are returning to Las Vegas because you can leave via Beatty (after visiting the ghost town of Rhyolite) and head back to Sin City. 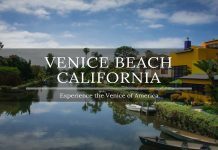 If you want to experience some attractions that are off this route, such as Dante’s View, you need to consider the best way to accommodate this and perhaps start even earlier in the day. It’s feasible but be prepared for plenty of driving. 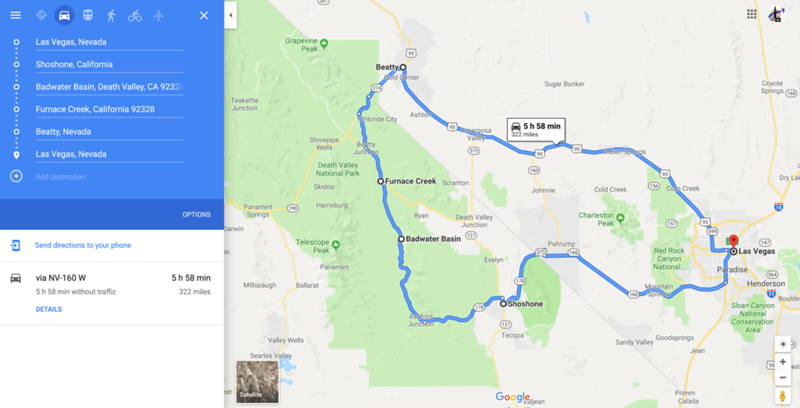 Another alternative for those of you taking a day trip to Death Valley and returning to Vegas is starting out in Beatty and then driving back via Death Valley Junction. 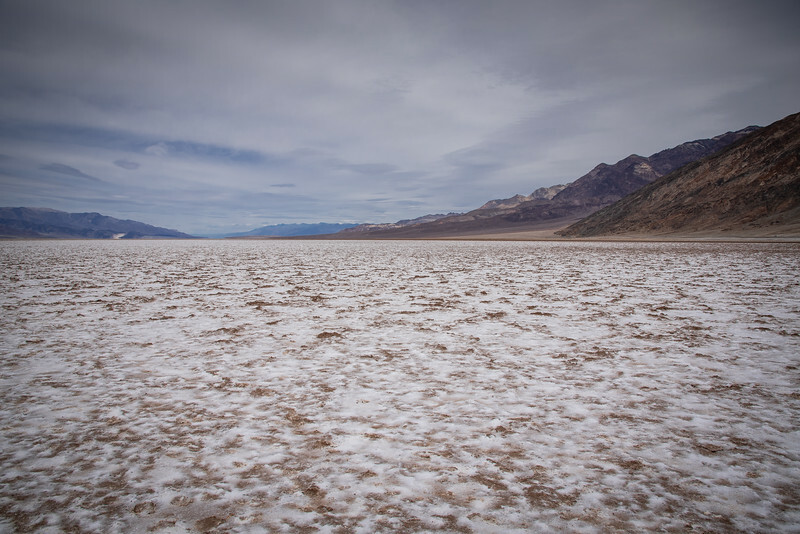 This will enable you to visit both Badwater Basin and Dante’s View but will require a little further driving. Either of the aforementioned options are a great choice for those that are staying in Vegas but cannot resist the temptation of a day trip to Death Valley. Las Vegas…to Death Valley…to Bakersfield, California…all in one day! Ambitious? Crazy? Optimistic? Exciting? All of the above for sure but I can 100% attest that if you follow this itinerary, you will have an amazing experience exploring this spectacular national park. 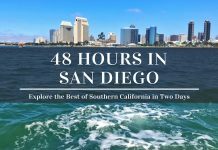 I will highlight some of my favorite spots along this route and how much time you should allocate at each attraction but realistically, this is an epic road trip that you cannot help but fall in love with. I would also add a caveat that you should probably be prepared to spend 13-14 hours experiencing this trip…I started my adventure at 6:20AM from Las Vegas and arrived in Bakersfield at 7:30PM, essentially 13 hours after leaving. 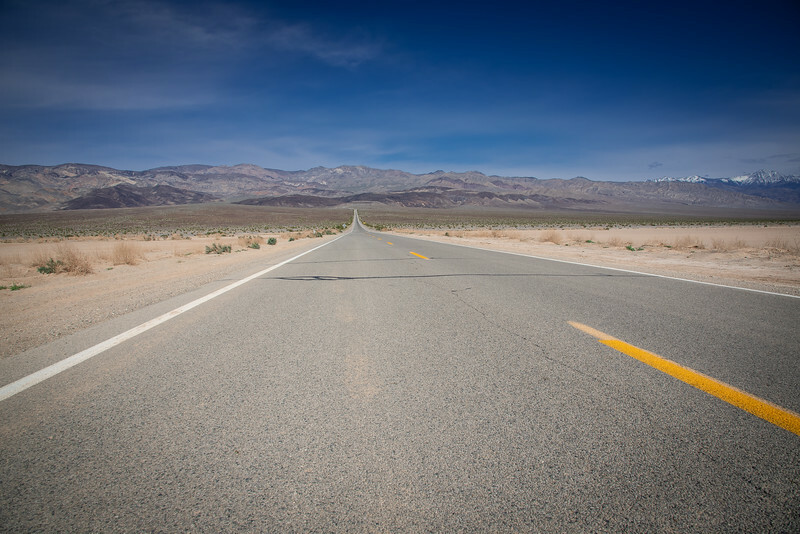 With 8 hours of driving time, that will leave 5-6 hours to explore the beauty of Death Valley…and trust me, you will need all of this time and more! After taking the infamous selfie at the entrance to Death Valley, I was ready to start exploring a national park that covers over 5,200 square miles. All of this in just 12 hours? Ok, a little unrealistic I know but there are still plenty of iconic landmarks worth exploring during your visit. Let’s take a look at some of my favorite spots that I recommend visiting. I should also add that the Furnace Creek Visitor Center is a place worth experiencing, not only because it’s one of the only places where you will get cell phone service but also because there is a plethora of information available, a gift shop and a place where you can stock up on fresh sandwiches and water. 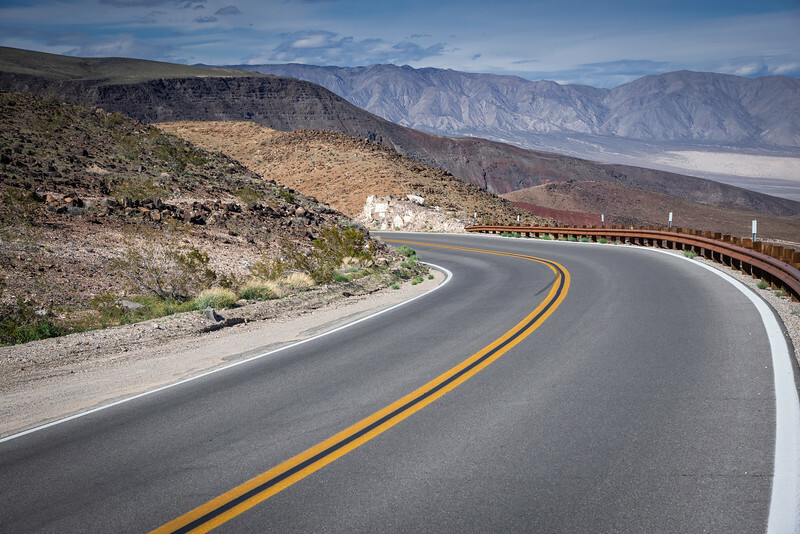 Although the aforementioned landmarks are pretty spectacular and not to be missed, much of the beauty surrounding Death Valley should be attributed to the panoramic landscapes and mile after mile of open road that just epitomizes the natural bliss associated with this park. From the depths of the lowest point in North America at Badwater Basin which I will share my experiences at later, to the heights of Dante’s Valley which stands at almost 5,700 feet above sea level, there is a vast difference between the two locations but both offer equally spectacular experiences. 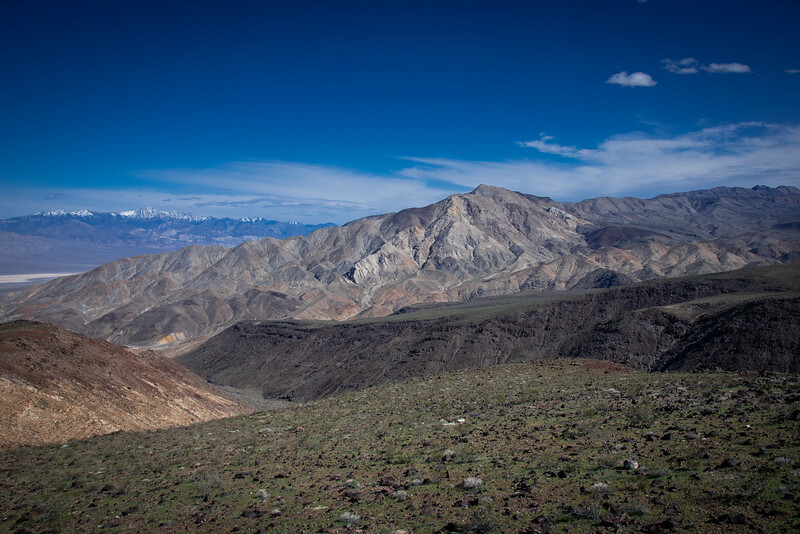 Renowned as the premier location for panoramic views across Death Valley, Dante’s View is an overlook terrace located on the north side of Coffin Peak. The winding drive to the summit of Dante’s View is easily accessible for cars but the final stretch with a gradient of 15% isn’t suitable for RV’s. The moment you park and start admiring the breathtaking scenery, you realize you are in a pretty special spot. 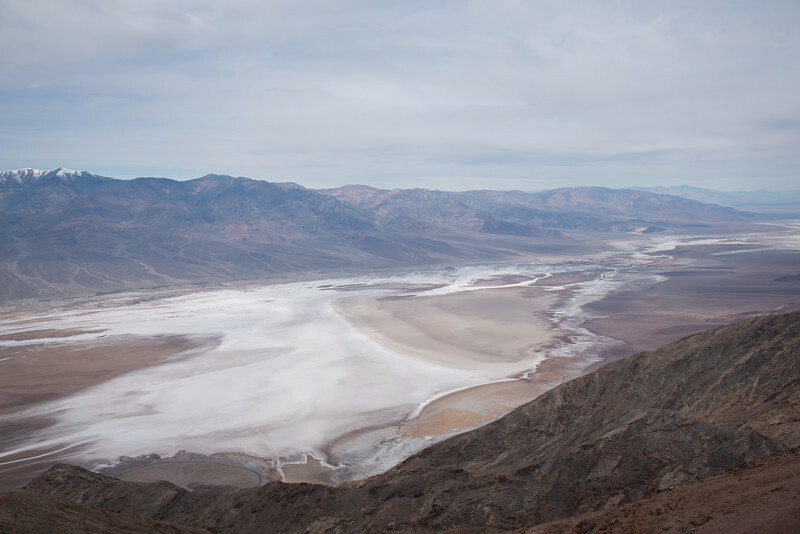 Take a quick glance over the edge of the overlook and peer down to the salt flats in Badwater Basin. This is a place where you could easily lose track of time and just relax while admiring the beauty surrounding you. I highly recommend taking a short hike along the ridge line to the left of the parking lot to catch a glimpse of more spectacular scenery. Just changing your angle of the overlook adds even more beauty to the region. This is one Death Valley’s iconic spots for sunrise and sunset pictures, so if you really want the ultimate experience, be prepared to wake up early to arrive in time to experience this. 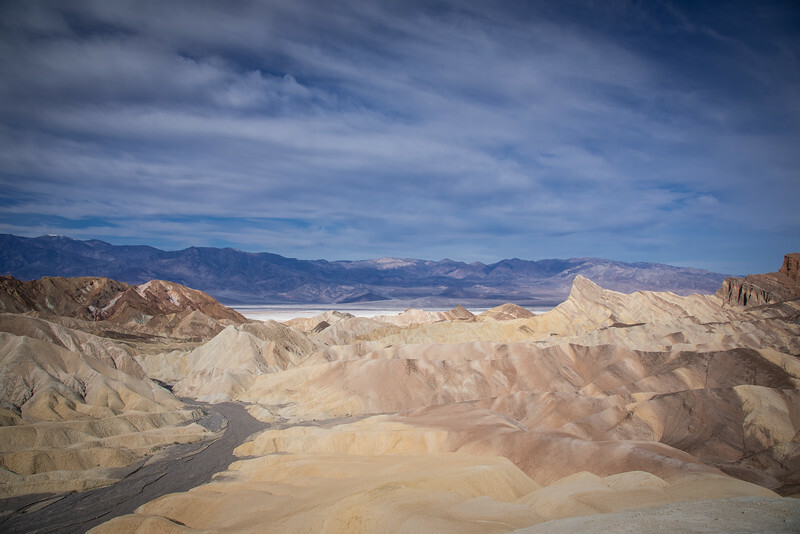 Driving back down to the lower depths of Death Valley, you could be forgiven for thinking that nothing will quite match the panoramic beauty you just experienced at Dante’s View. 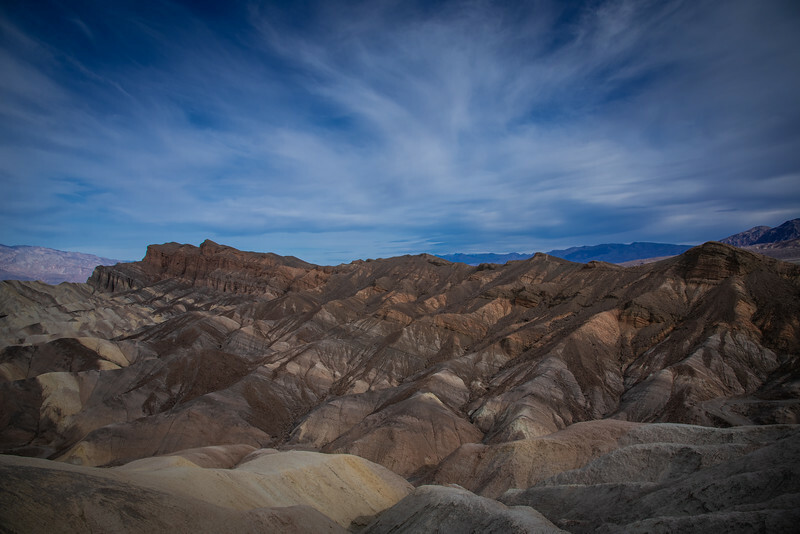 But just before you arrive at Furnace Creek Visitor Center, head to Zabriskie Point for yet another magical experience as you admire a myriad of geological formations in the Amargosa Range. 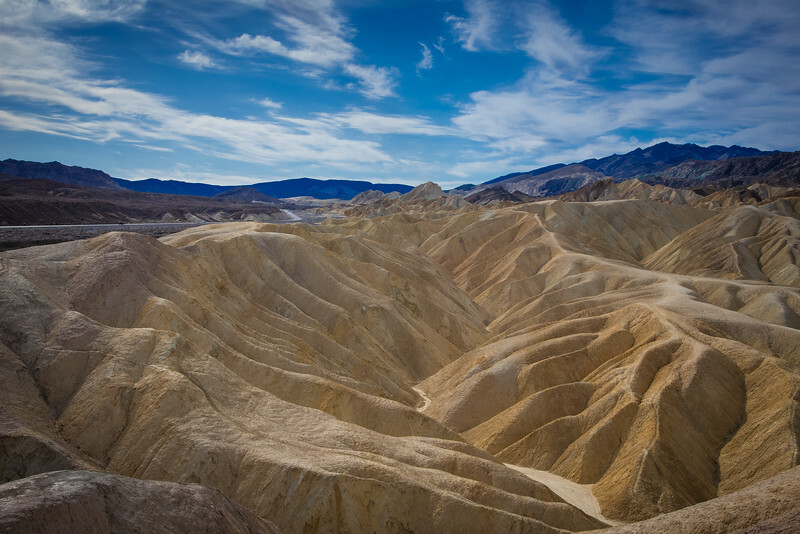 Zabriskie Point epitomizes everything there is to love about Death Valley from a geological viewpoint. 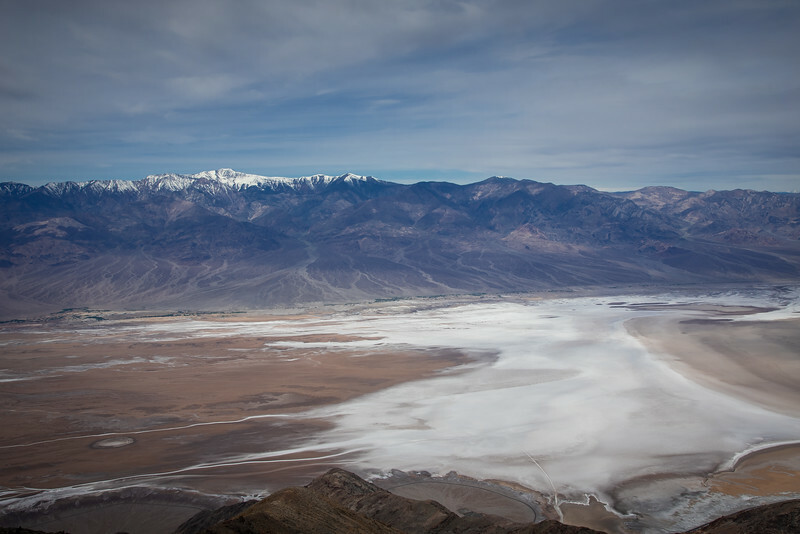 Regardless of your desire to hit the depths of Badwater Basin and start exploring the salt flats, the beauty on view from this vista point is unlike anywhere else in this park. The collection of colors is pretty epic, second only to the Artists Palette scenic drive that I experienced later on this trip. 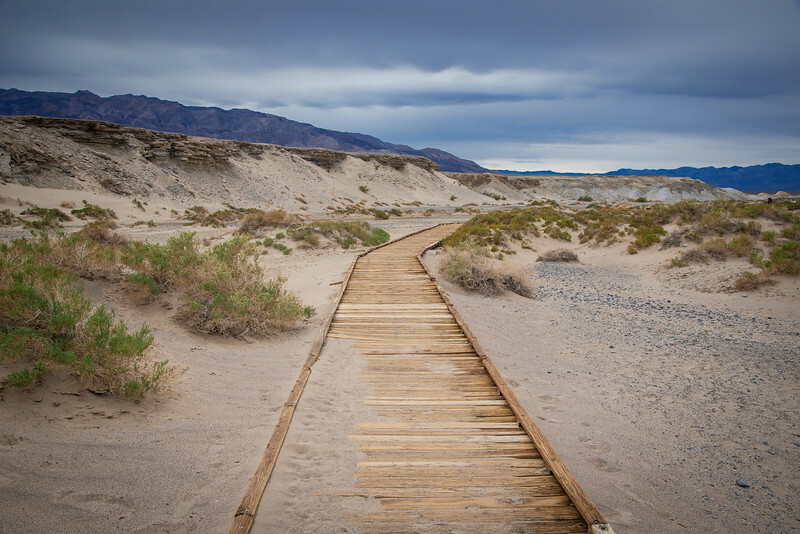 This trail-head is also the starting point of many hikes deep into Death Valley. 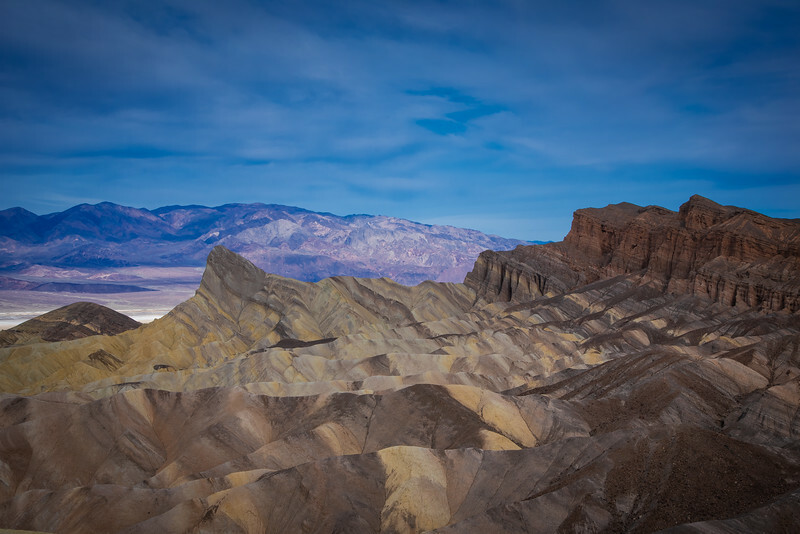 Standing at 710 feet in elevation, this is a perfect spot to enjoy both panoramic landscapes at a relatively high level before heading deep into the depths of Death Valley…be prepared to have plenty of water if you choose to go hiking! This is pretty much standard practice that should be followed in any national park but particularly in Death Valley where water is pretty much non-existent. 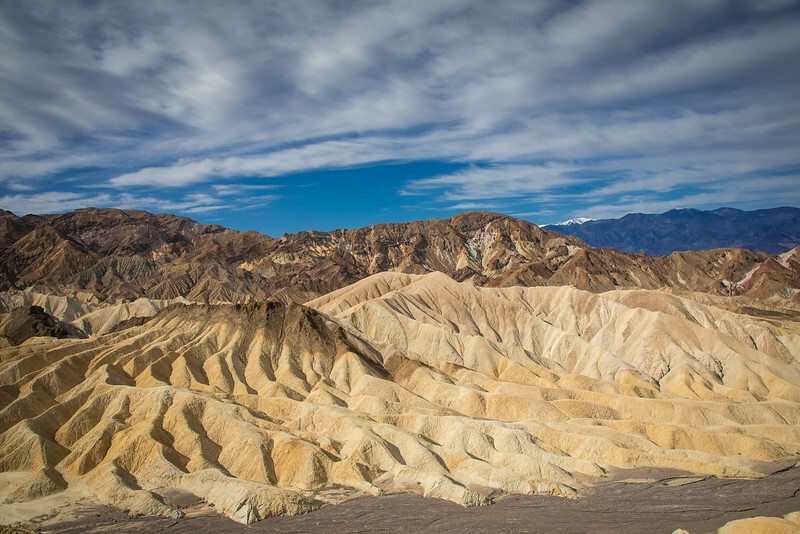 You will also find that Zabriskie Point is probably the most popular spot for avid photographers trying to capture the perfect sunrise and sunset shots. With such beautiful vistas and the vivid colors that are emphasized during the “Golden Hour”, it’s no surprise that this is so popular among visitors. 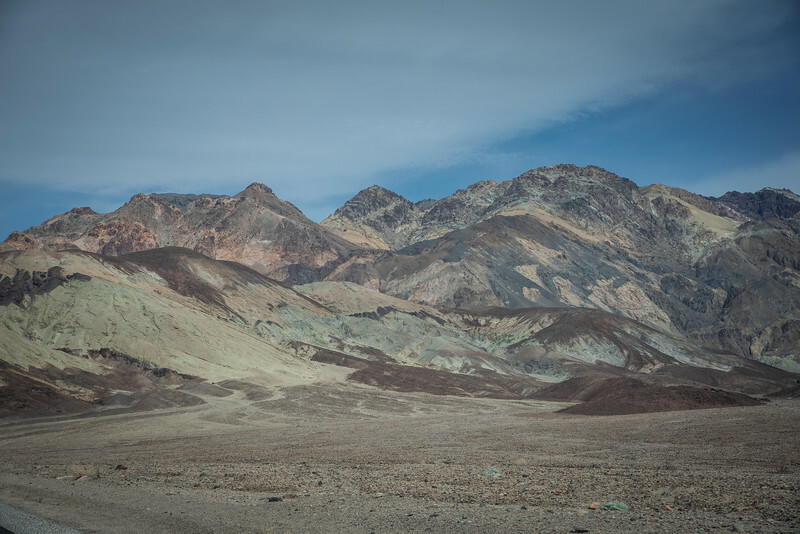 Driving around Death Valley is an incredibly scenic drive in itself but when you head towards Badwater Basin, you have the opportunity to experience a particularly unique “one-way” drive through Artists Palette. Measuring 5 miles in distance, this relatively short drive offers spectacular views and vistas while you meander through a canyon. 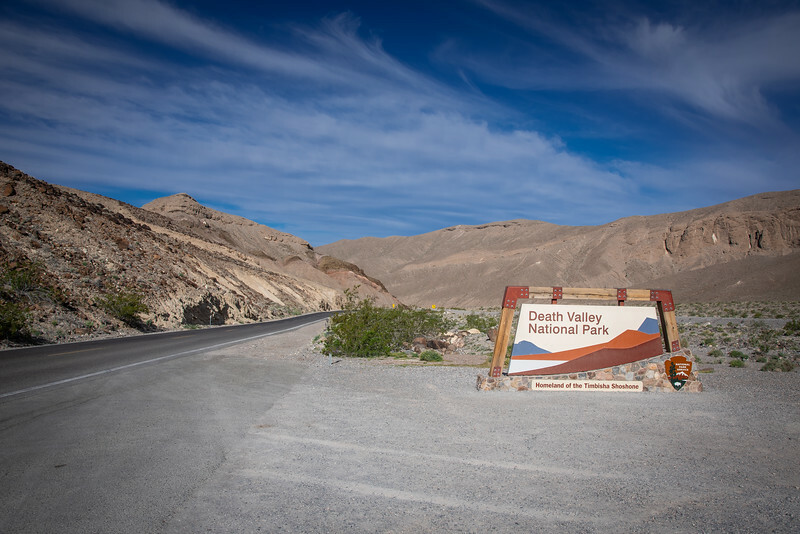 The drive offers a number of spots where you can get out and enjoy a short hike to capture better overlooks of Death Valley. Shortly after leaving Badwater Road, there is a cool spot where you can hike a short way to admire the view throughout the canyon. But it’s when you arrive at the section of the drive known as Artists Palette that you will immediately fall in love with this area. It’s not difficult to understand why this was named as such and without getting too technical, the plethora of colors is caused by the oxidation of the metals and elements found in the ground here. As you continue driving through the canyon, the scenery combined with the winding, narrow roads makes this an experience you will likely want to return to in the future. 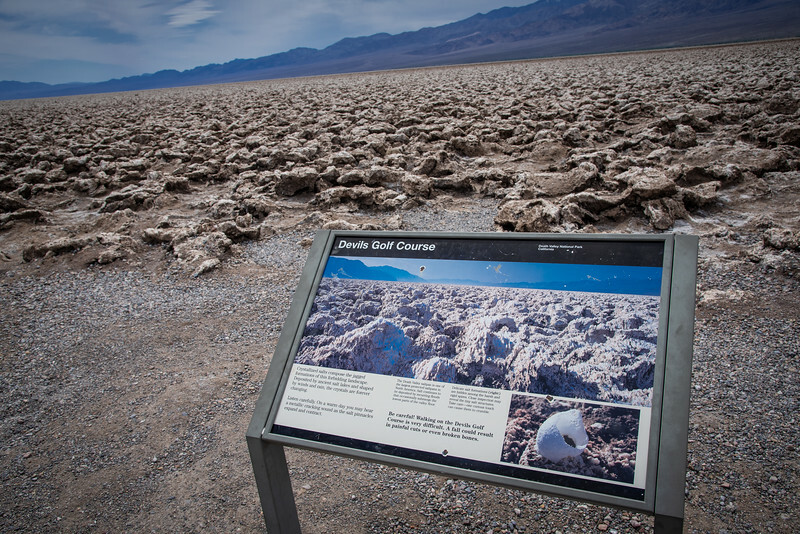 When I heard about the Devil’s Golf Course area of Death Valley, the golfer inside me made me really curious as to what this was going to be like. The moment you arrive at this landscape, you quickly realize that this realistically has nothing to do with golf. It looks nothing like a golf course and there is nothing that remotely resembles anything you would see on a course. But…here is the caveat, the above should take nothing away from the inherent beauty of this geological phenomenon. You can easily spend 30-45 minutes here exploring the area but PLEASE, PLEASE be careful!! Walking on this rocky, jagged landscape is incredibly difficult and one wrong step could see you tumble over and seriously hurt yourself. Just a short drive from the iconic Badwater Basin attraction, I would argue that this is even more spectacular and certainly less crowded. The salt formations are more distinguished here and you can definitely see how these have evolved and formed throughout the centuries. 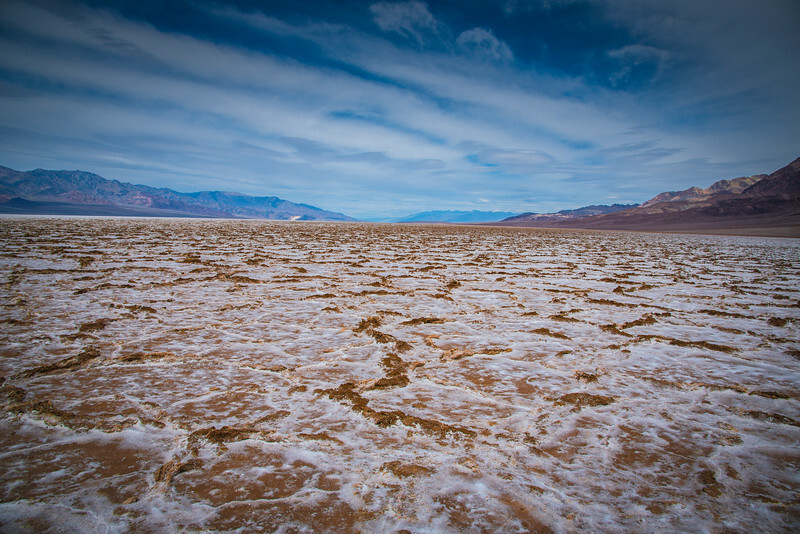 Death Valley is home to a number of iconic landmarks but perhaps the ultimate location that everyone should visit is Badwater Basin, home to the lowest point in North America. 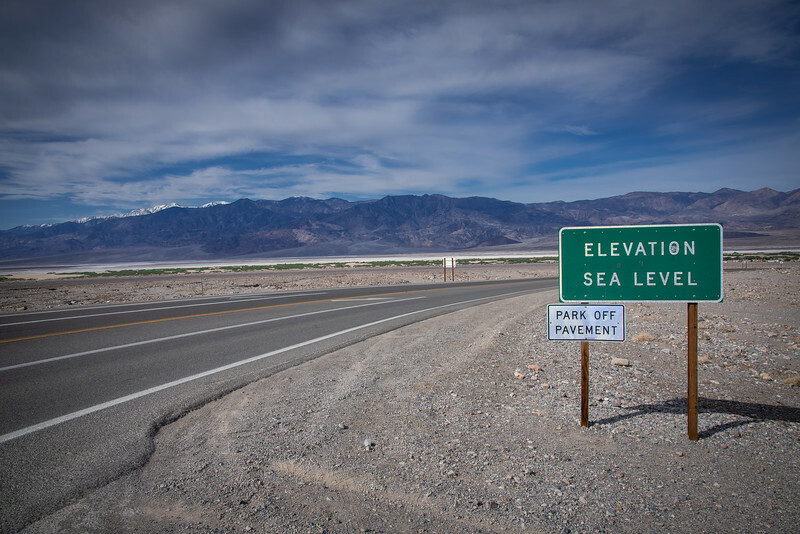 Before driving along Badwater Road, you will notice a sign indicating you are at sea level but as you venture out to Badwater Basin, you begin to drop to an elevation of 282 feet below sea level. After parking your vehicle, start walking out into the abyss of the salt flat. Devoid of any life or anything that would resemble a living species, this landscape epitomizes the term “middle of nowhere”. However, there is something quite magical about this landscape of nothing. 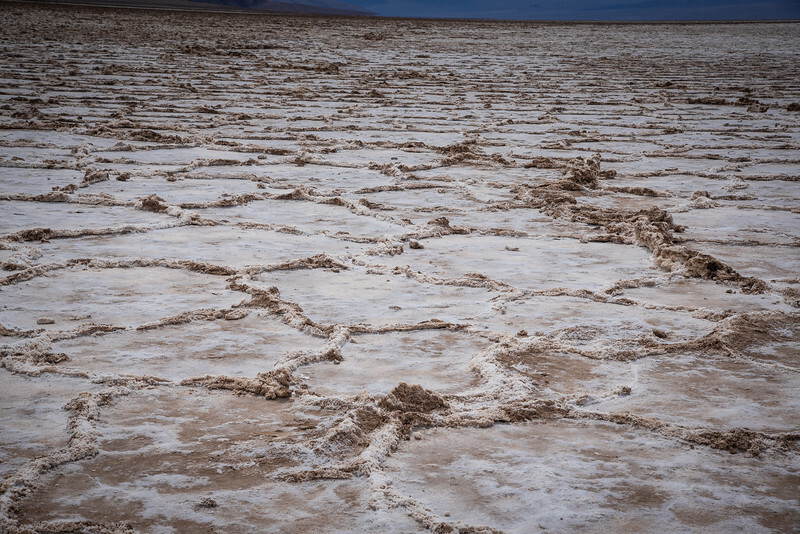 As you admire the geological phenomena present here, you can easily distinguish the shape and formations of the salt flats. The further you venture out and away from the path, the more noticeable the landscape becomes. 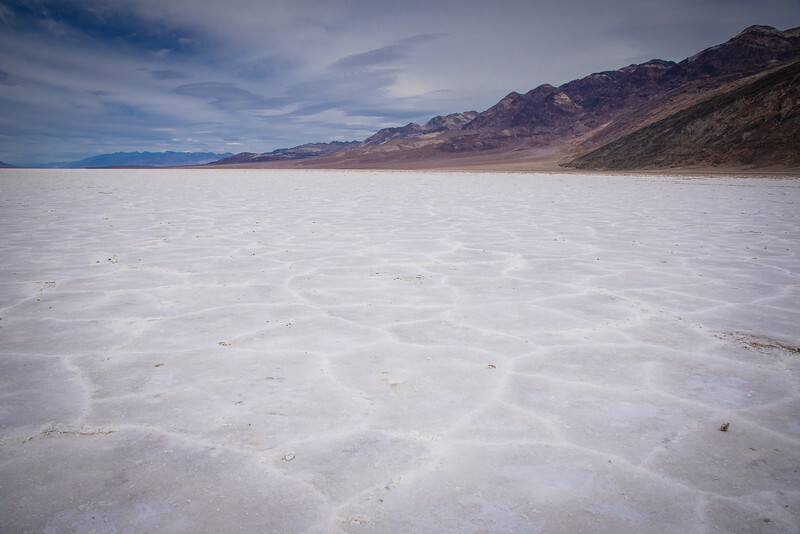 This 200 square mile area of salt flat is unequivocally the highlight attraction in Death Valley. 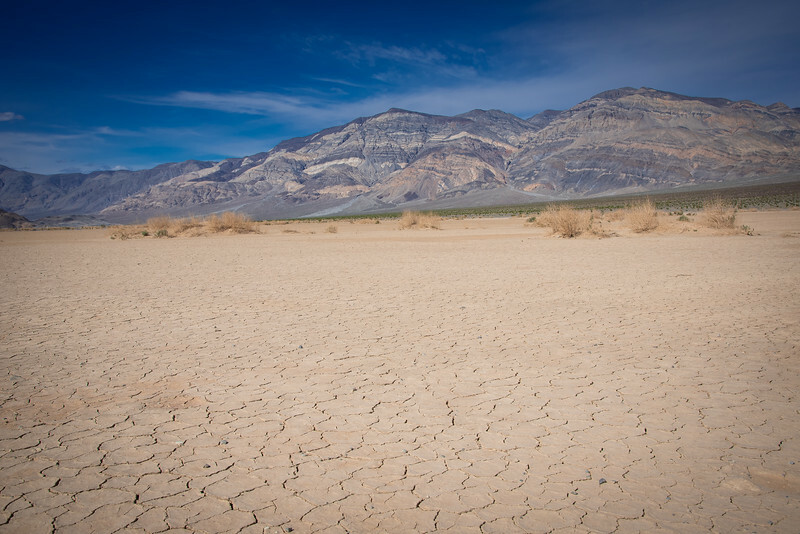 99.9% of the time, you are going to be part of a landscape that has zero water. 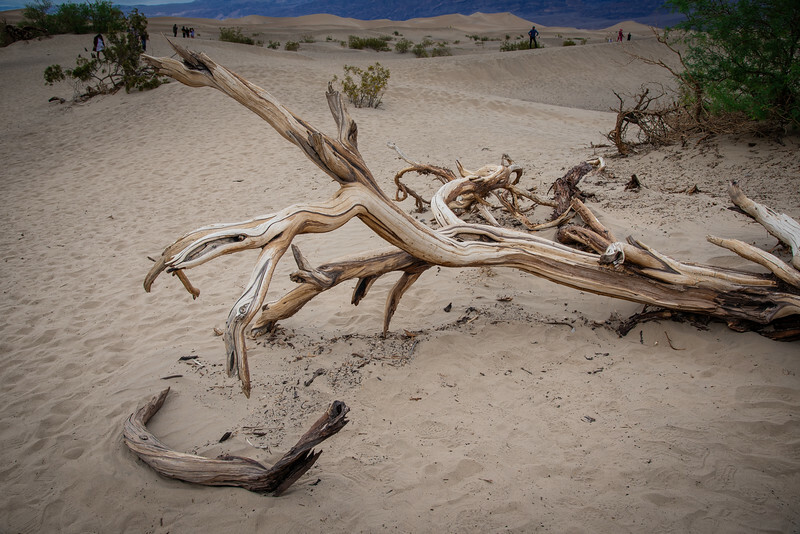 However, in 2005 a flash flood caused a lake to form here though this type of event rarely occurs anywhere in Death Valley. 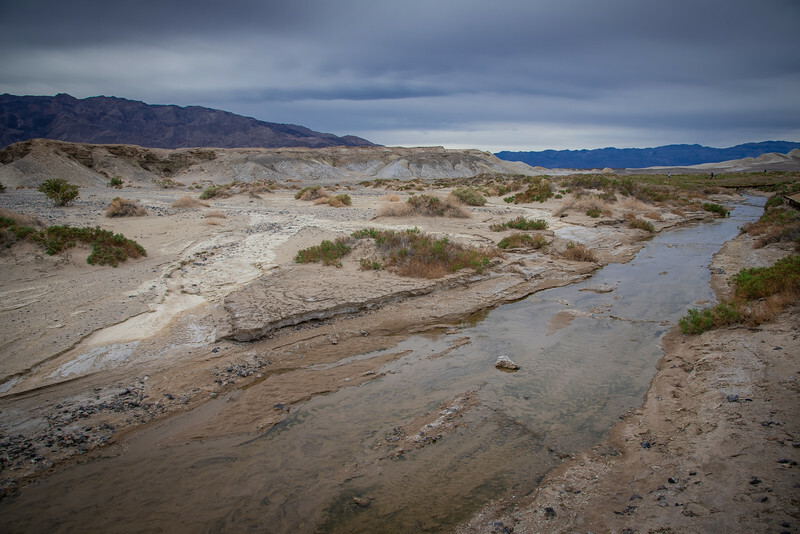 Although there is very little life that can survive the harsh climates of Death Valley, there is one species that has thrived in these conditions and can be found in Salt Creek just a short drive north of Furnace Creek Visitor Center. 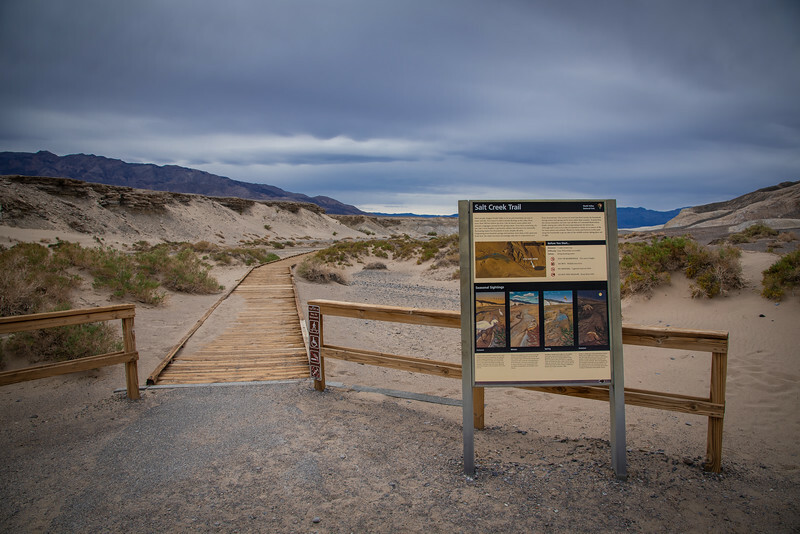 The pupfish, albeit a rather endangered species, can be seen swimming in groups along the Salt Creek boardwalk which is a great place to enjoy a relaxing hike while being entertained by the pupfish residing in their natural habitat. There are not many species that can survive in the ultra-salty stream of water that flows through Salt Creek but the pupfish are hardy folks that love to embrace these conditions. These fish are usually around one inch in length and can be found swimming in groups. If you visit during the months of March or April, this is definitely the best time to experience the pupfish in their natural environment. A walk along the boardwalk offers an opportunity to perhaps see other wildlife that survives here but regardless, it’s a great place to relax and admire the gorgeous scenery throughout this national park. 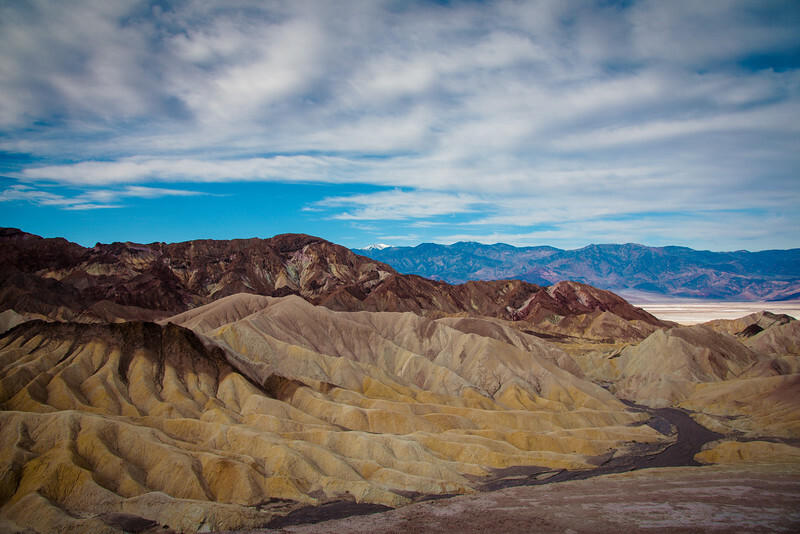 You have probably established by now that Death Valley is blessed to have a number of breathtaking natural attractions. 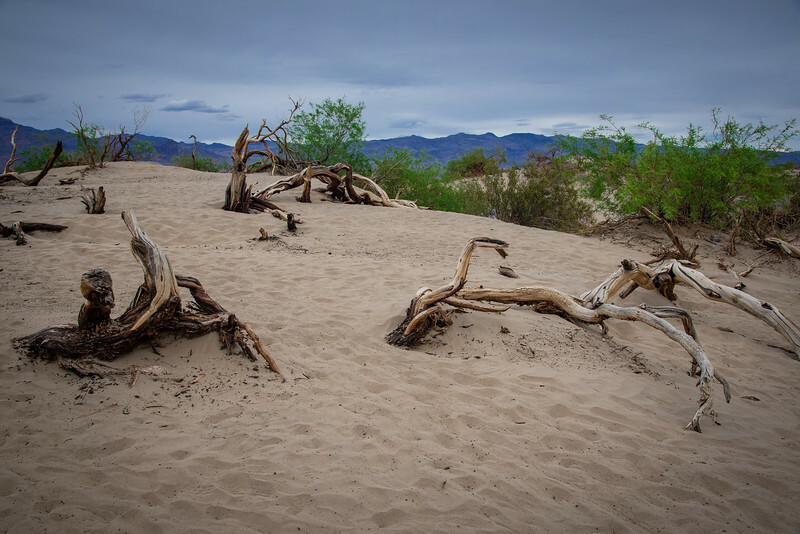 If you are following our itinerary and driving out west towards Bakersfield, one of the best final spots worth visiting are the incredible Mesquite Flat Sand Dunes. Although not the largest in the park, they are easily accessible and standing over 100 feet in height, they are definitely an incredible sight. You may see a number of folks heading out into the dunes with surfboards to experience a little “desert surfing” while for the photographers out there, this is definitely a perfect spot to capture sunrise/sunset shots with a myriad of gorgeous colors that illuminate throughout the dunes. 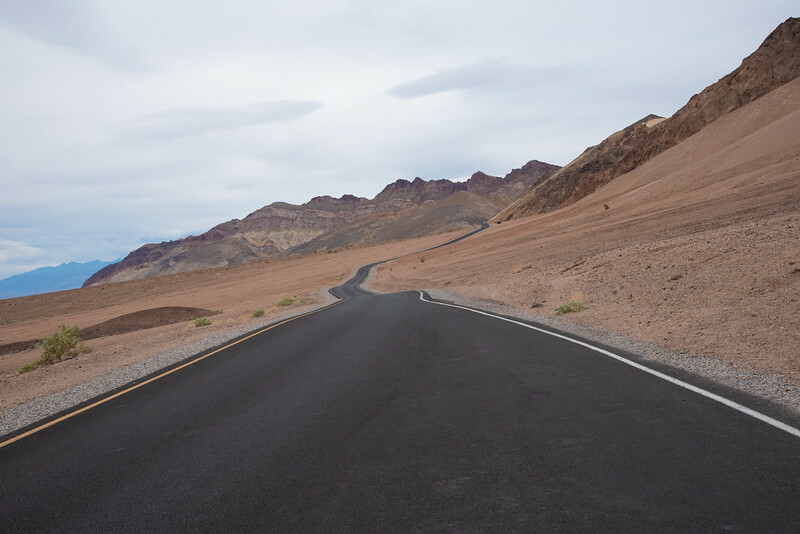 Visiting Death Valley National Park from any surrounding location is going to require careful planning, particularly if you only have a short time there. As you can see, I crammed A LOT into only one day exploring Death Valley but it’s an experience I will never forget. You may also notice that I missed some iconic attractions such as Mosaic Canyon (unfortunately the road to Scotty’s Castle was closed and this gives easy access to the canyon) and Ubehebe Crater but this probably helped make the experience of visiting Death Valley in only one day a little more realistic. It’s simply unfeasible to experience everything when you are taking a trip to one of the largest national parks in the States. 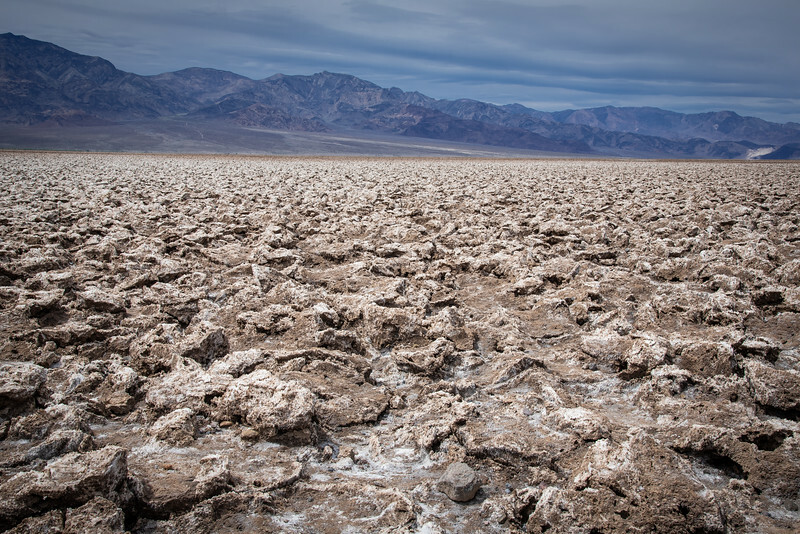 If you haven’t experienced Death Valley, hopefully you will be inspired to take a trip and follow some of my recommendations. Whether you have one day or multiple days inside this park, you cannot help but fall in love with some of the magical scenery to be found here…it truly is a majestic sight to behold! Great read guys! I’m originally from Las Vegas and we frequently went to Death Valley. Who would ever guess the desert to be so beautiful? One of my favorite places out there was Scotty’s Castle. It’s been over 20 years since I passed through Death Valley. I remember the Artists Palette as well as the heat. 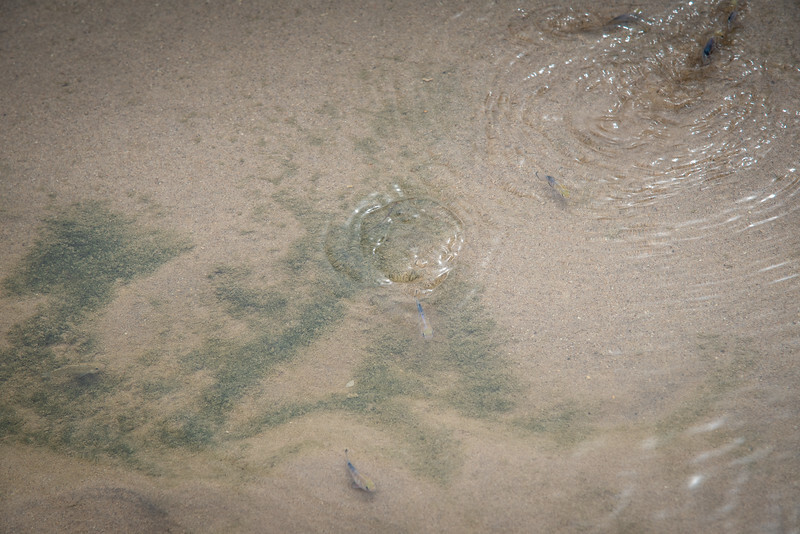 I did not know about the pupfish at the time and would enjoy seeing them in their environment.